Drupon Thinley Ningpo Rinpoche's teaching schedule for April 15-17, 2016 is finalized. All events will be at (but not hosted by) the United Church of Tallahassee on Mahan Drive, Tallahassee (between Magnolia and Capital Circle). The events will be in the sanctuary, the upstairs portion of the church. Please pre-register by emailing ddc.florida@gmail.com with your name and how many are attending. Chairs and some cushions will be available. Feel free to bring your own cushions and special seating. The recommended donation to cover our expenses is $30/teaching session and $50 for the empowerment. Nobody is turned away for a lack of money. There will be opportunities for group meals with Rinpoche on Saturday and Sunday. 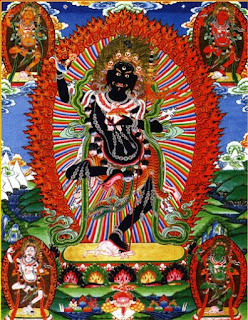 Vajravarahi is a form of Vajrayogini central to the Nyingma and Kagyu schools of Tibetan Buddhism. In the Extremely Profound Enlightened Intention of the Sublime Dharma treasure (Yangzab) it is the central dakini practice. This particular tradition of Vajravarahi practice is very special as it can be practiced from the views of the three outer tantras-- the mahayoga, anugyoa, and atiyoga or dzogchen. As such, one can approach the practice of the dakini from the perspectives of appearance and emptiness, bliss and emptiness, and awareness and emptiness. In his Saturday teachings, Rinpoche will focus on the anuyoga sadhana practice. This generation stage practice is the foundation for theExtremely Profound Six Dharmas, the completion stage with characteristics, the practices of tummo, illusory body, clear light, dream, bardo, and phowa. These are most famously known through the Six Yogas of Naropa, and are found here in the Extremely Profound Enlightened Intention of the Sublime Dharma treasure. In his Sunday teachings, Rinpoche will focus on the tsa lung and tummo practices of the Six Dharmas. In this practical teachings one works with the energy channels (tsa) and energies (lung) of the body to user the inner fire of the body (tummo) to bring about the realization of the primordial wisdom of bliss and emptiness. Since the generation and completion stage methods of vajrayana depend upon the stability of mind, Rinpoche will start this weekend of teachings with practical instructions on how to stabilize and calm the mind-- shamatha meditation. Drupon Thinley Ningpo Rinpoche is the resident spiritual teacher at Drong Ngur Jangchubling, a Tibetan Buddhist practice center in the Drikung Kagyu lineage of Tibetan Buddhism located in Wesley Chapel, Florida.